I'm not big on shopping when it comes to clothes and things but I could shop for hours when it comes to housewares, kitchen, and food related items. Leave me at Sur la Table and I could go missing for an hour or two easy. I actually live minutes away from a mall - no Sur la Table there, unfortunately (or maybe it's fortunate), but I often find myself nipping into Williams-Sonoma or to Crate & Barrel and Anthropologie to check out the home section. Inevitably, I often walk away with a little something - a plate, a mug, some kitchen tool I just realized I should have. I do try to control myself because I feel like I have all the essentials I need nowadays (and, as importantly, no place to store much else! ), but as you know, need and want are two separate things. And about a week ago, I succumbed to the temptation of the bundt pan. It's one of the things I don't have and probably don't really need but have always wanted. Well, hey...Williams-Sonoma was running a sale and I was being practical here. I bought a mini bundt pan - the smaller capacity works better for my small family and with the holidays coming around, I just know I'll have plenty of use for them by being able to make gifts of pretty little cakes. Right? Right! 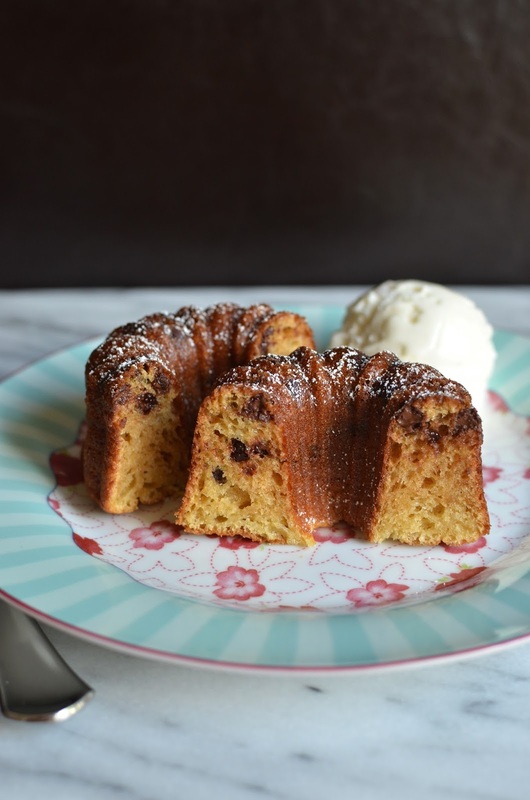 So when you think Fall desserts, maybe you think bundt cakes like I do. Why is that? I think it might have something to do with the rich, dense pound cake-like texture I often associate with bundt cakes. They're great spiced with all the flavors of Fall and they conjure up hearty and homey, the kind of things you want when the weather turns cool and the leaves start drifting down. Well, I know that sounds terrific but I went on a slightly different tangent with my inaugural batch of baby bundts. These little cakes are on the lighter side. They are spongy honey cakes, with toasted walnuts. I adapted a recipe I saw for Russian Honey Cake on Food52. I messed with the recipe by scaling it down to make just enough batter for my 6 mini bundts. That made it easy to then make the batter by hand. Rather than sour cream, I used whole milk Greek yogurt instead. I also added some vanilla extract for a little extra flavor. And I couldn't resist switching up the mix-in and making a couple of the little cakes with mini chocolate chips instead of walnuts (plus, I went with a more generous dose of them). Using two kinds of mix-ins confuses the process a bit but I just couldn't resist. These sponge cakes are lightened by whipping egg whites separately from the yolks. Besides the Greek yogurt and eggs, there's no oil or butter added to them. Don't expect cakes that are dense and rich like a pound cake though. What we have here is moist as in spongy, practically bouncy, little cakes that have a sweetness in part from honey. It was a good place to put the raw honey that I stock up at the farmer's market to good use. If you pick the cake with walnuts, you get a punch of nutty flavor from pre-toasting them (a must). If you go with chocolate chip, well...you pretty much can't go wrong. My son was a big fan of those and they were reserved for him. To be totally honest here, as dainty as these little cakes look, they're more like snack cakes, the 'pick up with your hands and eat with your fingers' kind of casual cakes. If I was into sweets for breakfast, these are the types of cakes I'd reach for. As I mentioned, I messed with this recipe a bit. Luckily, it worked out pretty well. 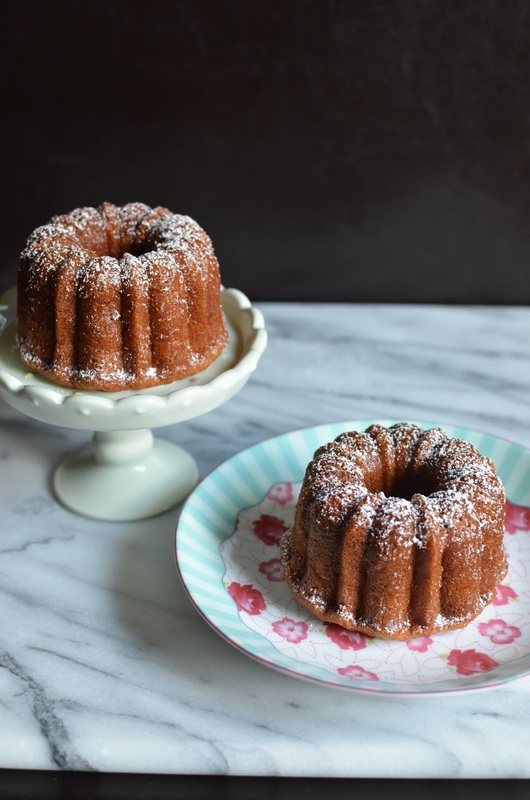 It was lucky that when I scaled the recipe down by a third, I had just about the ideal amount of batter to fill my six mini bundt cake cavities with. It also made it easy to make the batter by hand and I love being able to mix things up the old-fashioned way. The batter will be airy and foamy since that's the type of cake we have here, as we fold in egg whites at the last step. I filled my bundt cakes about 2/3 of the way. The cakes will rise all the way to the top and then some. I took a serrated knife and trimmed off the excess bulge in the center of the risen cakes but it's really not a big deal. If you're into spongy cakes and ever give these a try, and if you use nuts, I implore you to toast them first. It really contributes a lot of flavor and character to the cakes and toasting the nuts amplifies that at least tenfold. If you don't want to go the extra step of toasting nuts, there's always chocolate chips! Now, I know I said these are very much casual snack cakes you should pick up and bite into but if you want to doll things up a bit, you know a scoop of vanilla ice cream or a spoonful of whipped cream won't hurt a bit. The powdered sugar dust on top of bundt cakes just goes without saying if you're not using a glaze or icing. Preheat oven to 350 degrees. Spray a mini bundt pan with baking spray or prep with butter and flour. In a bowl, whisk egg whites until stiff peaks. In a second bowl, whisk egg yolks and sugar together until mixture is thick and almost white in color. Add honey, baking soda, salt, Greek yogurt, and vanilla, whisking to combine. Toss walnuts (or chocolate chips if using that instead) into the flour and add to the mixture. Mix together with a rubber spatula until incorporated. Lastly, fold in the egg whites until just combined. Fill mini bundt cake cavities about 2/3 way up with batter. Bake until cakes have risen, turned golden brown, and a cake tester inserted into the center comes out clean, approximately 20 minutes. Set cake pan on a wire rack and allow to cool for about 30 minutes before inverting and cooling completely. Serve with a dusting of confectioners' sugar over top. Cakes can be stored in an airtight container, at room temperature, for up to 3 days. I always find mini are cuter and prettier. Thanks to the Greek yogurt and meringue, these baby bundt cakes look perfectly light, moist and fantastic, Monica. OMG how sweet are these?????? I am just like you, although I like shopping for clothes I have also spend waaay too many hours and waaaay too much money on kitchen related stuff. This pan looks worth the money though! It's all the pan, which totally shows why I *had* to get it. ; ) This pan released the cakes beautifully so I think I got a good one. Yes, absolutely! I wish I could take a look into your cabinet!! Oh my - I bet there are some treasures in there. I'm so afraid to start looking at antique shops...I would be lusting after everything. haha. Thanks and you have a great sunny weekend, Tricia. 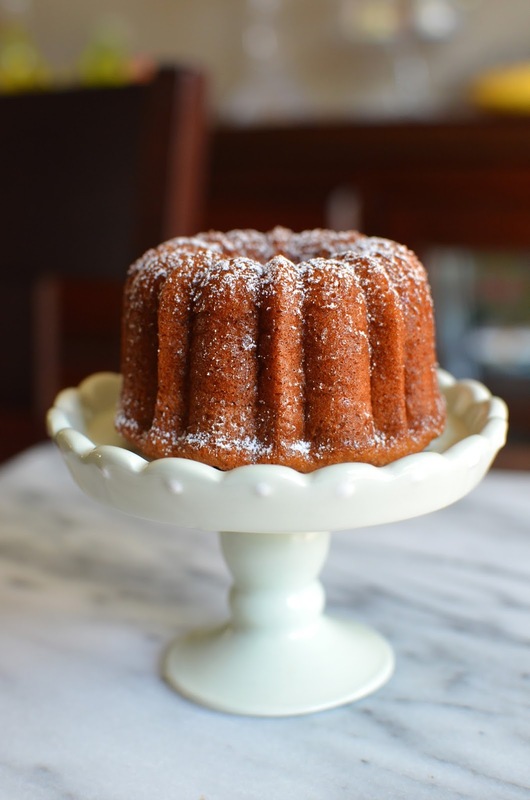 Yay for the mini bundt cake pans - these are so so pretty, Monica! :) Hehe I spend too much time drooling in Williams Sonoma and Antropologie too - totally wish we had a Sur La Table over here:) These cakes sound delicious, I love that you lightened them up and added different mix-ins - I can never decide on just one either. I would love them for breakfast or a snack, they look gorgeous! These are so cute! I love any baby or mini things! Looks delicious! And I am with you, Monica. I don't really shop for clothes. Sur la Table & Williams-Sonoma are my favorite places in the mall. There is a Williams-Sonoma outlet near vegas. I am dying to go! Your mini bundts are adorable. I'm always trying to think of how to size down recipes so our small family isn't tempted by a whole batch! Giving away some of the minis, or freezing them for later, is a perfect compromise. haha oh gosh I'm the same way in sur la table, williams sonoma, etc. I could spend so much time in them and want to buy everything!! How adorable! I have been wanting to buy one of these pans since so long. After your post, I think that's exactly what I am going to do. Gorgeous little cakes! Love! There is so much temptation, isn't there, Asmita! : ) You can just blame me if you do get one. I just finished dinner but now all I want is your cake. A few of them. YUM! Thanks, Lorraine. I feel bad messing with the recipe and I'm sure the original is great but thank you. How cute are these little bundt cakes and they look so moist and light. I would much rather shop for kitchen tools and such rather than clothes shop any day. I am glad you started to break these little pans in while you did as the holidays will be right around the corner and these would make the perfect little gift. Have a super weekend. Just shared! I definitely 'blame' the influence of the holidays! ; ) Hope you're having a great weekend. I totally know how it is. It's impossible to just nip into Sur la Table! There are a million little things to look over. : ) Glad you approve of my latest purchase. Those baby bundt pans are hard to resist, as are madeleine pans and so many more things! Sigh... ; ) And yes, I'd love to have the nuts and chocolate together but the little guy isn't into the walnuts so I wanted to separate it. Who could resist those cute pans! I only have a big bundt pan but now I'm thinking some small bundts are in order. This cake sounds amazing. Honey is one of my favorite flavors for sweet treats! I can totally understand! I know you have a very good eye for finding just the right pieces for your blog. A while back, I would buy this and that but I've really tried to tone it down and stick to the basics. It gets a little crazy...*but* I have this incredible urge to go to some antique shops after doing this post. Hi Monica, love the little baby bundts, honey is such a great way to sweeten this. I can see why you couldn't resist these mini bundts, so cute! They look amazing! Hi Marie! Glad you like it. And great to hear from you. Take care now! Entranced is the perfect word, girl!